When we hear of the word “Ginkgo Biloba,” the term “Brain-Boosting Herb” instantly comes to mind to some of us. For some, ginkgo nuts are better known as the delicious delicacy found in sweet desserts. Regardless of what comes up to mind, ginkgo is popularly recognised as a health supplement, nutritious food, delicacy, tonic or something generally good for health when consumed. These days we are seeing more and more of ginkgo biloba as one of the natural ingredients in skin care products. While the leaf extract has traditionally been used as a health supplement because of the many benefits when taken orally, it has now been found that the extract from ginkgo biloba leaves can also help to rejuvenate the skin and create youthful looks. This ingredient is found to have effects of firming up the skin as well as protection from harmful effects of the sun. What is in this plant that has such an amazing effect on our health and now becoming a popular choice as a natural ingredient for anti-aging skincare and sunscreen products? Is it as effective on the skin as the known remedies on bodily health? Ginkgo biloba (commonly called “ginkgo”) is a unique species of tree and is also known as the “maidenhair” tree. In Mandarin, it is known as the “Yin Xing” tree. The genus name “ginkgo” comes from the Japanese word “Gin Kyo” meaning silver apricot. Due to the concerns of food poisoning, it is now more common to use the extract of the ginkgo leaves for medical treatments or as health supplements. The extract contains lesser ginkgotoxin and appears to be safer when used orally and appropriately. Also, with the extract, there seems to be a higher concentration of the substances that provide the most benefit for the human bodies. EGb 761 or ginkgo biloba extract is the standardised extract of ginkgo biloba collected from its dried green leaves. You won’t believe how ginkgo biloba can help revitalise your skin and create a more youthful appearance(? )!It also prevents premature aging and protects your skin! Finally let us explore how ginkgo can help to revitalise the skin and create youthful looks. What are the properties found in ginkgo that helps prevent premature aging and protects the skin? Earlier, it was mentioned that the ginkgo extract contains high levels of flavonoids. Among the flavonoids components, Quercetin, that is found in high concentration in the ginkgo biloba extract, is a powerful antioxidant that fights free radical damage. When the antioxidant levels in the body are lower than those of free radicals, the immune system is overloaded and aging occurs more rapidly. Therefore, the antioxidants help to slow down the aging of the skin and reduce the appearance of wrinkles, fine lines and sagging skin. Ginkgo biloba is also very relaxing and helps to make a person overcome stress, another factor that causes wrinkles and fine lines. Like oral treatments that reduce anxiety, applying it on the skin can also provide a calming effect. Fun fact: Ginkgo Biloba Extract is a rich source of antioxidants! It contains approximately 24% flavonoids (primarily quercetin, kaempferol and isorhamnetin) and 6% terpenoid lactones. You may be asking why we’re mentioning flavonoids and terpenoids whatever those are instead of talking about antioxidants, what does it all mean! Therefore, we know that ginkgo biloba extract is a rich source of antioxidants. What then are antioxidants for and what effects do they have on our bodies? Antioxidants are substances that helps prevent or delay cell damage typically triggered by a process called “oxidative stress” caused by free radicals in our body. Free radicals are highly unstable molecules. With the advancement of technology, we are increasingly polluted with more chemicals and radiation that results in increasing generation of free radicals. Therefore, it is essential that we replenish our bodies with antioxidants and ginkgo biloba has been found to be one great source of them! Therefore, antioxidants are also claimed to have anti-aging benefits because it helps to slow down the process of skin cells degeneration. Ultraviolet (UV) radiation from the sun is one of the main causes of skin cancer and it also damages the fibres in our skin, called elastin. When this happens, our skin sags and loses the ability to return to its original position when poked, pinched or stretched. Therefore, it is important that we protect our skin when exposed in the sun for too long. UVA – This is the longest wavelength and penetrates the skin deeper than UVB rays. These rays are linked to long-term skin damage such as wrinkles and can cause skin cancer. UVB – These rays are partially blocked by the ozone layer but is the one responsible for sunburns. They damage the skin cells’ DNA directly and are thought to cause most skin cancers. UVC – This is totally absorbed by the earth’s atmosphere and we encounter it mainly from artificial radiation sources and not from sunlight. Typically, sunscreen products will contain UV filters to either reflect and scatter the UV rays or to absorb them and dissipate them as heat. The Sun Protection Factor (SPF) measures how effective the sunscreen is in limiting the skin exposure to UVB rays that burn the skin. The higher the SPF, the higher protection but this measure does not measure protection against UVA. Research has shown that adding ginkgo biloba into a sunscreen formula with UV filters enhances the performance of the sunscreens. Therefore having ginkgo as one of the ingredient in a sunscreen makes it more effective in the protection against these harmful rays. Did you know that Auolive’s Award winning moisturiser, the DayGlower protects your skin from both UVA & UVB rays? Click here to find out more! Another great benefit of gingko biloba on the skin is the “anti-viral, anti-microbial, anti-inflammatory and anti-allergic therapeutical agents in ginkgo extracts”  that helps cleanse your skin from bacteria. This is one of the reason why this natural plant ingredient is used in facial cleansers. Due to the anti-inflammatory properties, gingko biloba extract can also help in acne, rosacea, eczema and skin sensitivity. Gingko biloba extract speeds up the healing process by reducing the swelling of capillaries and improves the skin’s regenerative abilities. This can help to prevent scars and marks on the skin after an outbreak. Did you know that Ginkgo is also used in Medical Treatments? Traditionally, ginkgo has been used by Asians as a herbal remedy. In recent times, ginkgo is also being used for various medical treatments in the West. According to the University of Maryland Medical Center, ginkgo is now widely used in Europe for treatment of memory problems, such as dementia and Alzheimer disease. Ginkgo helps to increase the blood flow and oxygen to the brain to alleviate memory-related problems. Research also suggests that ginkgo can help protect nerve cells that are damaged in Alzheimer diseases. Studies have shown that ginkgo improves thinking and cognitive functions and help alleviate feelings of depression. As ginkgo is helpful in improving blood circulation, studies have also shown that it can be used as treatment for intermittent claudication, a symptom that describes intermittent muscle pain on the lower limbs resulting from mild exertion such as walking. The pain tends to disappear after a brief rest but recurs when the patient resumes walking. 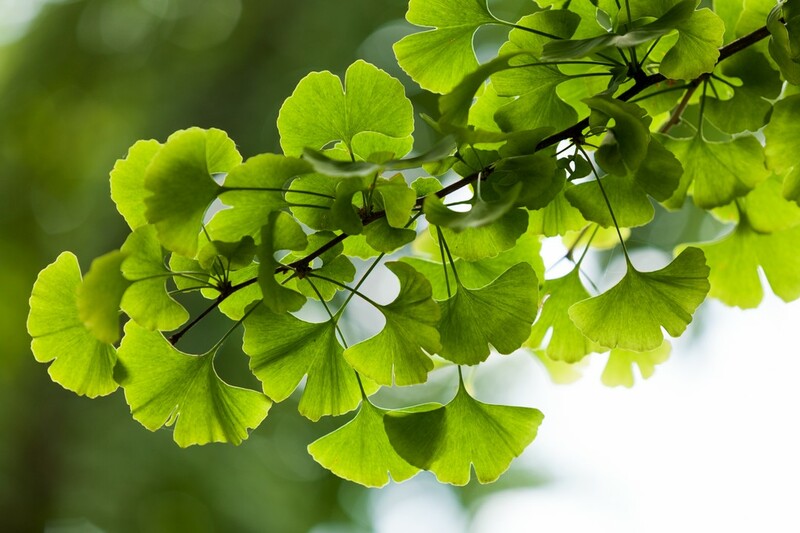 While ginkgo biloba extract has been found to provide medicinal benefits when consumed, it is fast becoming an ideal natural plant-based ingredient for skin care products due to the many benefits for the skin as well. Collagen helps to repair skin tissues and is required in the replacement and restoration of dead skin cells. Collagen production in our bodies tend to decline as we age and ginkgo extract can help to replenish the collagen and firm up the skin. This is the key to youthful skin. As we grow older, collagen production slows down, making our skin vulnerable to exposure to various factors such as sun damage. Therefore, if we want to keep our skin wrinkle-free, we want to increase the production of collagen. One of the ways to do that is to apply ginkgo-based skin care products. A common problem for the skin is clogged pores due to constant exposure to dirt and pollution. If you live in a city, you can hardly avoid air and chemical pollution and it becomes more important for you to effectively cleanse your skin, but the last thing you want to do is to expose your skin to more chemically-laced facial cleansers. The good news is that ginkgo is also a natural cleanser that can help open clogged pores and help cleanse oily skin. It is therefore common now to find ginkgo as an active ingredient in facial cleansers. Applying gingko biloba on the skin can help to get rid of accumulated dirt, oil, sebum, debris and other impurities. Furthermore, ginkgo is found to be suitable for all types of skin be it dry or oily skin. In conclusion, ginkgo biloba extract is an essential natural ingredient to have in skin care products, especially in the ones used to filter off harmful UV rays. In addition, gingko biloba extract produces collagen and is rich in antioxidants, making it ideal if you are looking to have youthful skin free of wrinkles and lines. It can also help to firm up the skin and makes a good natural cleanser. When used with skin care products to moisturise the skin, it adds to further nourish and revitalise the skin, adding a special glow to the complexion. Due to the multitudes of benefits to the skin, ginkgo biloba extract is one of the natural active plant-based ingredients found in the Auolive Day Glower™. Auolive Day Glower™ is an award-winning* Antioxidant Brightening Moisturiser with SPF 30 and UVA & UVB sun-screen protection. It not only moisturises and nourishes the skin, the presence of ginkgo biloba extract helps to revitalise and firm up the skin. It also provides a boost in anti-aging for the skin. This is possible because of the high levels of quercetin, a powerful antioxidant with inflammatory and defensive properties to prevent capillary fragility and boost collagen formation. The Auolive Day Glower™ is enriched with a luxurious blend of natural active ingredients like ginkgo biloba extract and squalene, ensuring the skin receives the moisture and nourishment it needs to stay soft, supple and healthy.